Anyway, in reality, my eating wasn’t that bad, but I was not as careful as I usually am about monitoring my carb intake. Thankfully I came to my senses last week, and now when I see white, I run the other direction. Case in point, my daughter and I went out to lunch yesterday and the server brought two very pretty white rolls, one of which had a sugar coating on top. I relied on my tried and true question: “How will I feel five minutes from now if I ate that?” Foods I really love are ones I make allowances for, and while the white flour/sugary buns called my name, I wasn’t feeling their love. I knew I’d feel yuck physically and emotionally if I ate them. I stuck to my spinach salad and broccoli and the very yummy house dressing that, while not calorie-friendly, was very satisfying in small amounts. The dressing is what I wanted, not the rolls, and so I planned for it. The longer I travel on this road, the more I refrain from labeling some of my favorite foods as “bad,” because the only thing that makes them “bad” is that I let them tell me how much I should eat instead of me telling them how much I should eat. It’s all about who’s boss. I’m not sure if this is exactly pertinent to what I’m trying to say, but in 1982, my mother gave me the silver-plated utensils she’d received when she and Dad got married. Eight forks, knives, soup spoons, and serving spoons, two butter knives and a pickle fork. She bought me a red velvet-lined silverware box in which to store them. I kept that box in a drawer in my grandmother’s buffet that I’d inherited, and I took them out to use only on special occasions, mostly Thanksgiving and Christmas. I took all the utensils out of the red-velvet box and placed them in a Tupperware silverware rack and moved them to Pittsburgh, where I use them every day. The best part is that every time I use a spoon or fork or knife, it reminds me of all those special occasions – from the time I was a little kid up until Christmas 2009 – when my mom or I set a table. My mother’s silverware – housed in a very ordinary kitchen and used to eat very ordinary food – is meant to be enjoyed. It’s special just by virtue of its history, but it’s still utilitarian. And I get to be the boss of it. It’s the same thing with food. Knowing what’s special and why, affording ourselves that which is special and working it into what it also precious to us – eating healthy – is the ongoing gift of eating right, of no longer assigning good and bad labels to the things we love. Whether you eat with your hands, a plastic spoon or a 14-carat-gold fork, I hope the food you choose to eat is worthy of you, your body and your aspirations. Always remember, you are the boss of you. This entry was posted in Memories, Mindfulness, Weight Maintenance on January 6, 2011 by Lynn Haraldson. I'm using the “good” silver for exactly the same reason. Ooops… that said good child, not good china. You knew what I meant, right? I have the same relationship with 'good' clothes that you describe with the silverware. I only seem to wear it when someone will see me, I am going somewhere. Sweats or jeans if I am home. My 16 year old can get all 'dressed up' even when spending the day at home. She dresses for herself. Wonderful post, Lynn. I have my grandmother's china and some antique silverware, and I have often thought that they should be used regularly. P.S. 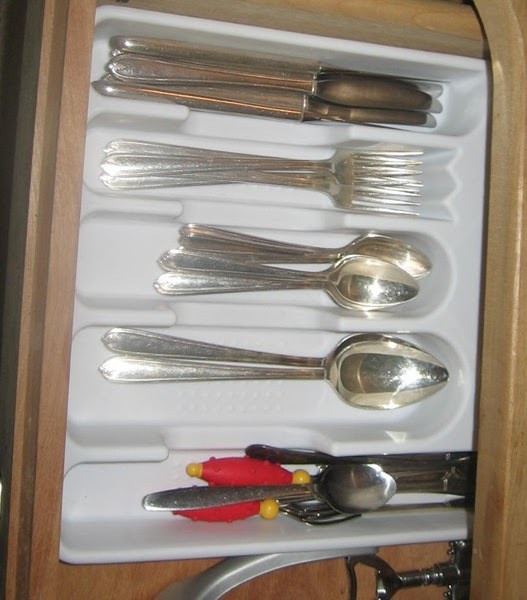 your silverware drawer looks a lot like mine–not because of the silverplate flatware, but because of having a child's spoon and fork set as part of it. It just looks so right! I've been trying for years to explain to people why I refuse to think of foods as good or bad. You just did it for me in one paragraph. Thank you. Oh Yes!!! It is meant to be enjoyed – food, silverware and life! I love this. This past year, I stopped labeling foods as good or bad. It's amazing how much it's changed me. I finally realized that food does not control me. You are so right! I'm the BOSS!! I love this….where can I get that 14 carat fork? I bought my Mother a nice gown the year she died. She would not wear the night gown, as she was saving it. I teased her that she was 94 years old, what was she saving it for. Now I use my nice things often. After all, my life is a special occasion. Well said and will be practiced. I blogged about a slight weight gain recently and have been clawing my way back to my reality, not the reality I can sometimes talk myself into: 'Oh, it's all right to eat those things, now.' Um, no it isn't because I have an issue with control. Always trying to remember that I am the boss of me. I like that being able to keep great memories all around you. Thats very important to feeling good too. Hey I am not a really great commentor but please today will you go read my blog and consider maybe requesting your lovely group of followers do the same. I am sure it will help them and you make some really great memories. I also really want to thank you for your continued blogging support even though you may not have realized it. bought a pair of leg warmers yesterday. Like to wear shorts or capri length workout pants (even in the winter). warmers are wonderful. Vickie, I would like to start wearing things that I like just because instead of waiting for special occasions. Legwarmers, however, ROCK. HCGPower, thank you for sharing that story. Please let us know if she gets the dog! Well said. I spent the last year in crazy amount of life transitions and I let it get the best of me, and I paid the price. I'm up more than I have ever been since losing 100lbs, but that was then, this is now. I'm taking care of myself, and like you I'm the boss of what goes into my body. Yesterday, I spontaneously walked into what I thought was a full-service restaurant. Only to find the most beautiful French pastries. I endulged in a buttery almond croissant and a skinny latte and enjoyed every moment, but didn't use that as an excuse to eat the fork,knife or spoon. The rest of the day was just an ordinary day. I think I might need to blog about that…thanks for the idea. What a good “get back on track” post! You are right…I'm the boss of me!! Thank you Lynn for always being so sensible. I, too, lived with a mother who kept all of the “good” stuff in a china cabinet to be used only once or twice a year. When illness forced her to move in with my sister in 1989, I was given my favorite set of china which she had only used about 5 times. I use them several times a week. I've even bought pieces on eBay to fill out the set. It gives me such a pleasure to use those dishes, not just because they were my mother's but because they are beautiful. My mother-in-law gave me a set of silverplated flatware when I got married, and I used those daily till I wore off most of the silverplate. I love to use beautiful things. Loved this whole post, Lynn! Would have missed it if Helen hadn't linked to it! Love that you are actually using 'special' stuff that brings back happy memories. I never did get that saving stuff for a once a year celebration. And second, one of my favorite phrases is ” you're not the boss of me!” Now I will apply it to those darn foods that try to boss me around! How timely my reading of this blog is. I had just made the declaration today that I would go and buy myself a fancy silverware set for 1 that I can keep at work and maybe one for use at home too. I do have a lovely set of sterling silver forks/knives and spoons from my grandmother that I just may dig out too.